GT Simulator, Setting benchmarks, not limits. 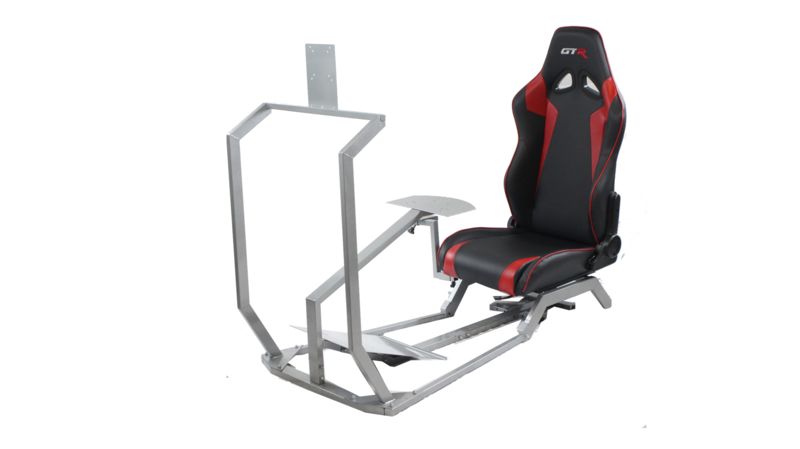 The GT Racing simulator comes fully equipped, with the Side Gear shift mount for the professional racer. Using those deft clutch moves and heel-and-toes, you can show your friends what can be done. The shift lever is placed just where you need it when you need to pull off a split-second downshift coming out of a corner, the wheel and pedals are where they need you be when you are moving flat-out on a track. At 10,000 RPM, you don’t know if that sound is coming from the game or from you. The GT racing simulator adds another level of race car realism with a fixed bucket racing seat and lower profile, inspired by F-1 cars. The GT Racing Simulator redefines video gaming authenticity, positioning you much like an F-1 driver in an open-wheel racer cockpit. The no-compromises driving position is where you want to be when pulling serious virtual G’s. *Monitor, Logitech G27 Steering Wheel, Shifter, and Pedals are not included. "Very satisfied with my purchase. Excellent quality and easy to assemble. Very solid and holds the monitor at the right height to driver"
"Would Recommend good quality good value good product! Easy to assemble and sturdy. I like it overall."